Kim Kardashian tweeted a very special birthday message to Kanye West, the father of her unborn child, for his 36th birthday anniversary. 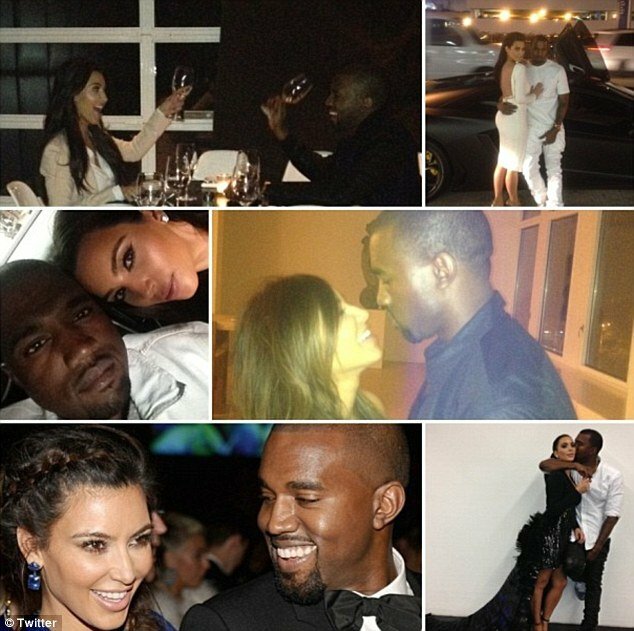 Kim Kardashian, 32, created a photo collage of her favorite magical moments with Kanye West on Saturday in honor of his birthday. “Happy Birthday to my best friend, the ❤of my life, my soul!!!! I love you beyond words!” Kim Kardashian tweeted along with the sentimental collection. The selection of six photos that Kim Kardashian chose to express her devotion were a balance of moments captured both in their public life dressed up in designer dresses and tuxedos, and private glimpses of them enjoying one-on-one time. In one picture, Kim Kardashian and Kanye West are seen snuggling up closely together in a sweet self portrait, while in another they are raising glasses in a cheers – no doubt to each other – over a romantic dinner. As they stand arm-in-arm dressed head-to-toe in white, there is no doubt that the power couple are made for each other. With their first baby due this summer and his highly-anticipated new album set for release on June 18, it is no doubt going to be a big year for Kanye West. While Kim Kardashian was more than willing to make a very public birthday greetings to her future baby daddy, just two days earlier she complained about living life in the spotlight. She unleashed a rather perplexing Twitter rant about the paparazzi and wanting to have a break from the spotlight 24/7. “I get I live a public life,” she wrote on Thursday. “I live my life on a reality show for the world to see. I love my life, but when the cameras stop, that doesn’t mean I don’t want a break too. Hours after her plea for privacy, Kim Kardashian was back on Twitter posting selfies and sharing video taken inside her home.